IN THE SPOTLIGHT ON WFSB! 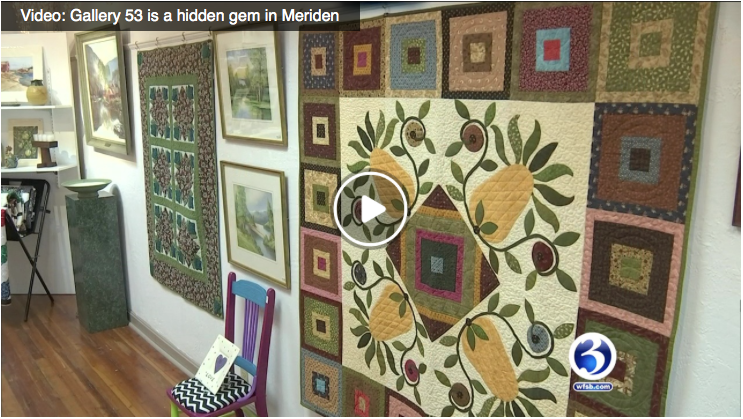 Gallery 53 was delighted to be featured in Nicole Nalepa's "Every Town Has a Story" feature on Meriden aired on WFSB Eyewitness News on February 9th! The segment also featured Ted's Steamed Cheeseburgers and Meriden's Antique Veterans! See how regional artists exploit the creative potential of textiles to create new, exciting and meaningful works. Opening Reception Saturday, April 1th, 12 - 2 pm, on exhibit until April 27th. more . . .
WINETASTING & CHAIR-ity EVENT on April 13th! Check out the one-of-a-kind, artist-created chairs and sample fabulous food and wines donated by local restaurants and wine merchants. more . . .
110th ANNIVERSARY GALA on March 10th! Join us for our spectacular birthday bash featuring music, martinis & munchies! more . . .
Gallery 53, showing off their holiday display and sale, had a record number of visitors and sales. Janet Gawlak, a volunteer manager for the Gallery, said, “We have never seen so many people at the Gallery at one time before. We had many sales and the buyers enjoyed the free gift wrapping. Many also said it was their first time at Gallery 53”. ​"Out and About: Learning About Mosaics"